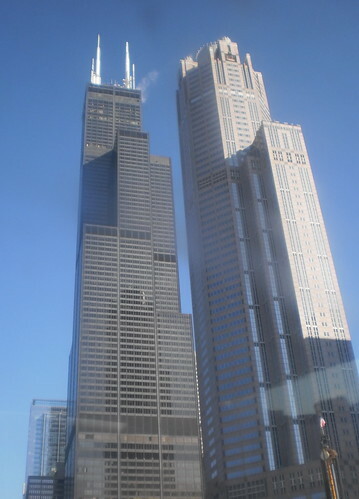 Remember the shot in yesterday's blog post that had the Sears (Willis) Tower and the building next to it, which I learned is called the "311" building for its address? Well, I had to go back into the city again this morning. Wee bit different weather. Isn't that an amazing sky? Spring is coming. I drove north along Lake Shore Drive and got this shot across from Lincoln Park. It's almost the same location where I took the southbound one on Wednesday. Nevermind that there is a breeze out of the north northwest that makes the air temperature hover around the upper 30's. It's in the mid-40's. I sometimes miss my college days when deciding not to attend English class was a choice. It would not have been a choice to ditch work, park the car and walk along the lake, as much as I would have liked to. This is the area where those cars were photographed being stuck during the Groundhog Day blizzard. You've seen the photo. I'm not reposting it here. I don't want to be depressing when the sun is shining so brightly.